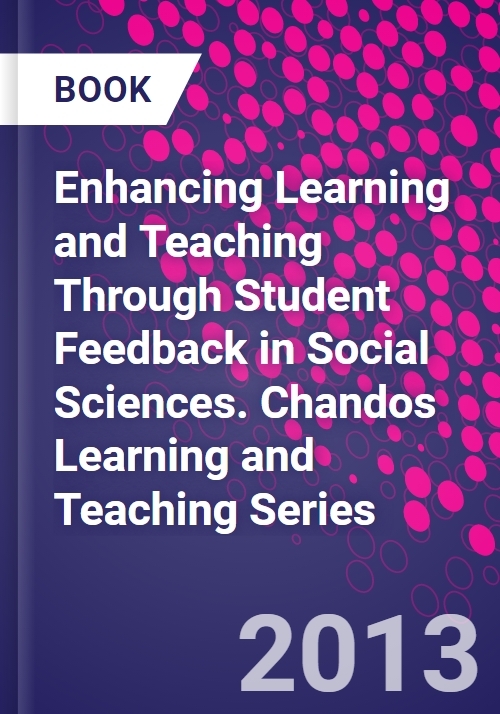 This title is the second Chandos Learning and Teaching Series book that explores themes surrounding enhancing learning and teaching through student feedback. It expands on topics covered in the previous publication, and focuses on social science disciplines. The editors previously addressed this gap in their first book Student Feedback: The cornerstone to an effective quality assurance system in higher education. In recent years, student feedback has appeared in the forefront of higher education quality, in particular the issues of effectiveness and the use of student feedback to affect improvement in higher education teaching and learning, and also other areas of student tertiary experience. This is an edited book with contributions by experts in higher education quality and particularly student feedback in social science disciplines from a range of countries, such as Australia, Europe, Canada, the USA, the UK and India. This book is concerned with the practices of evaluation and higher education quality in social science disciplines, with particular focus on student feedback. Implications: how can evaluation be improved? Nair, Chenicheri SidProfessor Chenicheri Sid Nair is currently with the Centre for Advancement of Teaching and Learning, University of Western Australia (UWA), Perth. Prior to his appointment to UWA, he was Quality Adviser (Research and Evaluation) in the Centre for Higher Education Quality (CHEQ) at Monash University, Australia. He has an extensive expertise in the area of quality development and evaluation, and he also has considerable editorial experience. Currently, he is Associate Editor of the International Journal of Quality Assurance in Engineering and Technology Education (IJQAETE). Prior to this he was also a Managing Editor of the Electronic Journal of Science Education (EJSE). Professor Nair is also an international consultant in a number of countries in quality and evaluations. Mertova, PatricieDr Patricie Mertova is currently a Research Fellow in the Department of Education, University of Oxford, England. She was previously a Research Officer at the University of Queensland, and, prior to that, a Research Fellow in the Centre for the Advancement of Learning and Teaching (CALT) and the Centre for Higher Education Quality (CHEQ), Monash University, Australia. She has recently completed her PhD focusing on the academic voice in higher education quality. She has research expertise in the areas of higher education and higher education quality. Her background is also in the areas of linguistics, translation, cross-cultural communication and foreign languages.